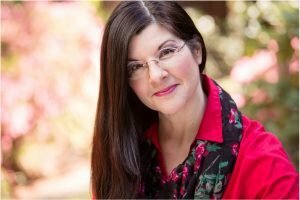 Angela Breidenbach, Author and Genealogist, speaks April 13, 2019 on researching genealogy in Scotland. Have you wanted tips on how to research your Scottish ancestry? Or learn what to see and do on a genealogy tour of Scotland? You’re invited to a talk on researching Scottish genealogy in Scotland. I’ll be sharing my experiences with Scotland’s People, various Scottish libraries, travel, where to stay, eat, and fascinating places to visit in Edinburgh, Glasgow, and more. 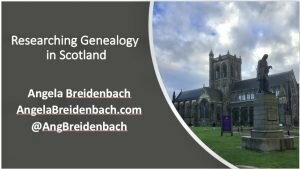 Learn how to start your journey into Scottish genealogy. Hosted by the Bitter Root Chapter of the Daughters of the American Revolution. 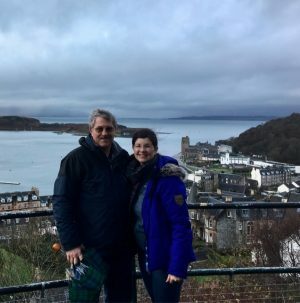 Angela and Mike in Oban, a seaside village in Scotland. During our time together, I’ll share how much I was able to learn including a surprise discovery! Slide presentation with gorgeous photography will help you see and feel Scotland as well as enjoy a bit of sightseeing and culture. Tips for traveling with family and still getting your genealogy research done! From Glasgow to Edinburgh, Oban to the Mull of Galloway Lighthouse, the ancient Sweetheart Abbey to Brig O’ Doon, we’ll travel Scotland together gathering history along the way. Don’t miss Tips on Researching in Scotland with Angela Breidenbach! Previous Article Previous Article: Where has Angela Been?